Home Home Improvement What’s So Great About Commercial Vinyl Flooring? When you have to choose vinyl flooring tiles for your office floor, then the entire process is very complicated. There are a variety of options available and thus, you might get confused and you won’t know how to choose the best one. Here, we are going to talk about a few points that would help you in finding the best commercial vinyl flooring. Durability: You must be confirmed about this fact that the initial look of the tiles would remain same for the years to come. The reason is that any commercial flooring is subjected to an extreme level of damages like higher foot traffic, thus you should select the flooring that can withstand any critical damage or extreme use. There are two options one is Vinyl Composite Tile (VCT) and Luxury Vinyl Tile (LVT), which are apt for extreme pressure and higher foot traffic in your office. But yes, you have to do the maintenance work. The LVT is more durable and it is less prone to any scratches and scuffs, as it has a clear wear layer, which keeps the printed surface protected. The LVT would be the best option for the higher levels of wear and tear. The thickness of the clear layer determines the lifespan of the tiles and this thickness could be anywhere between 8 mm to 28 mm. so, as per the traffic in your office, you can choose the tiles. Cost efficiency and easy maintenance: the maintenance requirements of the two types of commercial vinyl flooring are very different from each other and you have to choose the one which is easier to maintain. If the maintenance work is complex and expensive, then the flooring would not be profitable for you. Select the flooring whose maintenance could be done easily under your budget. What should you be looking? : regular mopping and sweeping are required by both the VCT and LVT flooring in order to keep the flooring clean and dust free. And yes, VCT also regular polishing and waxing are also necessary because the wax coating keeps the tiles protected from the regular wear and tear. Thus, to maintain the VCT flooring you would be spending more and if your business is small, then it won’t be a good choice for your office flooring. Aesthetics: Obviously, the visual appeal of the flooring is essential for you and you would never want your flooring to look unpleasing. The flooring influences the mood of the employees, thus you should never forget that overall design and ambiance that the flooring creates is a necessary factor that would help you choose the best flooring. What should you be looking? : You must consider where and in which room you are going install commercial vinyl flooring. 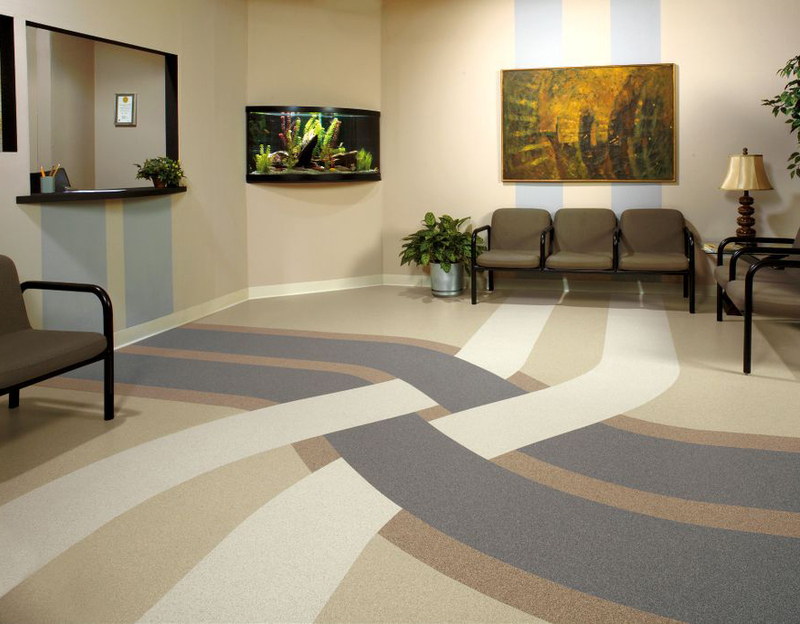 If we talk about the VCT, then now people relate it to the hospital flooring and comfortable for a sterile environment. But, in an office, you would never want such event. But, for your rescue, the vinyl tiles are there and they come in various designs and are available in a wide range of styles. Thus, you can find any design you want, like an abstract pattern that would be the best option for wood like flooring. With luxury vinyl tile, you can create a desired pattern and creates any texture which inspires you. Designs on the VCT are very flat, but with LVT you would enjoy a distinctive look and you would get the flooring that looks similar to wood and natural stone. The total cost of ownership: You can easily decide based on the price, if any flooring is right for you or not. But, you should consider the total cost of ownership for the entire lifespan of the tiles. It is possible that the tiles with the lowest price would need more labor for the installation and thus, would be expensive in the end. Also, the cleaning and maintenance cost is something that can increase the cost and make the flooring expensive. What to look for? : with commercial vinyl flooring, you can find the total cost of ownership, like with VCT, you would need intensive labor and high maintenance work including the polishing, sealing and waxing. Thus, you have to spend more for the maintenance of these tiles. But, with LVT with regular mopping and sweeping you would be able to maintain the condition of flooring. Size of the plank: you can buy vinyl plank in various sizes and as per the size the price would change. For the larger planks, the installation time would be less and the procedure would be easy. With smaller planks, the time, the labor and the complexity would increase. But, yes you also have to consider the area, like for smaller spaces the small planks would be a good option. For larger rooms, you can buy larger planks and also save some installation time and cost. Choose wisely, as wastage is not something that you want. Toughness: this factor would help you in choosing the planks which are tough enough and could go long way. The planks which lack toughness aren’t strong enough, would get damaged easily and their lifespan would be just a few years. Thus, either you talk to an expert or check online for the toughest commercial vinyl flooring. At Jupps Floor Coverings, we provide the most reliable flooring services, which are best for any office premises. Also, our experience speaks for you, as we have served so many customers in so many years that now we know which office needs which flooring. We are not saying all this just like that; the happy faces of our customers are a proof. If you are also looking for a flooring service, which can fulfill all your flooring needs and that too under your budget, then there is no better option than Jupps Floor Coverings. To avail our services, feel free to get in touch with us, we’d be more than happy to assist you.